In 2002, Steven Spielberg released Minority Report to good reviews and mediocre box office. In it, Tom Cruise manipulated screens with gestures while wearing special gloves. Less than a decade later, we are have the first devices that are using technology inspired by it. iPhones and Droids allow you to gesture around the screen and control your phone, and other people are developing wearable computers that key in on gloves worn by the user and can do all the things a laptop of cellphone can do. 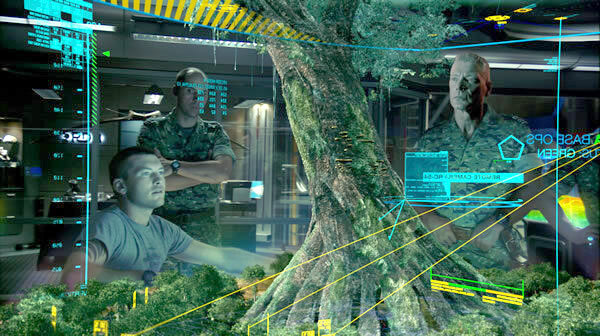 In Avatar, the people view their data in holographic wireframe displays that appear to float in the air. These impressive displays allow viewing areas up to 180 degrees and give an immersive ability to one’s data. Although their usage was strictly work and strategically related, not only could they lend themselves to these military applications, but they would be great for managing all forms of information as well as entertainment applications. From managing spreadsheets to watching movies and playing games, these screens could revolutionize the way we use computers. When sharing data, the people passed back and forth glass sheets that appeared to contain screens of data. With the recent advent of the iPad, we have taken the first steps towards this device, but while the iPad comes across as an expanded iPhone (according to the media, I haven’t played with it yet and won’t be able to until it is released in the near future), the pad in the movie looked like an extension of the computers being used by the people. If the iPad can find a way to create its market and find its audience, we could one day see the pad as used on Pandora. The other major technology for me was the holographic table on which they strategized the attack on the Navi. They were able to view the tree from all sides, zoom in and out and ultimately get a 3D perspective to plan their attack. As General Dodonna showed the attack on the Death Star on a screen, 30 years of technology and film making gave us new ways to look at data. We have holographic technology now, but requires too much to do it as efficiently and interactively as done in Avatar. Jake was able to put his hand into the hologram without completely disrupting the image. James Cameron created a completely fleshed out world, where the military has mechs and surgery is possible to repair the spines of paraplegics. The movie takes place about 150 years from now, but it’s very likely that the computer technology of Avatar inspires engineers like Minority Report and we begin seeing the computer technology created using similar tech within the next ten years, and those ignored tech elements get referred to in news articles about our every day technology.